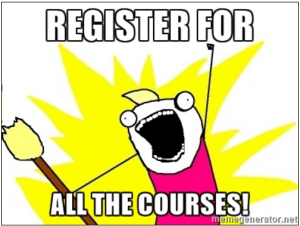 So Many Courses, Not Enough Memes…. May 1 was National Decision Day. While English and Creative Writing majors currently enrolled at the U of I are wrapping up the semester, those joining the University of Illinois’s incoming Class of 2020 are starting to think about Fall courses in preparation for their summer registration visits. Those already here are at an advantage for planning next semester: the Department’s second biannual Course Showcase at the end of March introduced them to some highlights from the fall course offerings. The Department of English offers a variety of opportunities to gain valuable skills transferable across a wide range of academic disciplines at the University and to future career paths after graduation. VO: What did you do after you graduated? 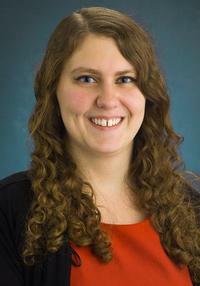 Melissa: When I graduated, I was working with the University of Illinois Press in their marketing department. I had an internship with them that began in August 2010, so I continued that internship throughout the rest of the summer of 2011. Then, in August 2011 I got a position in the marketing department in Human Kinetics in Champaign. I worked there until July 2015, when I started with University of Illinois Extension doing marketing for them in Champaign, Ford, Iroquois, and Vermillion Counties. VO: Can you tell me a bit more about what your current job entails? To learn about her career in video editing and her other experiences after graduation, I recently talked with U of I English alumna Beth Cohon. Be sure to check out the sample of her work, linked below! VO: When did you graduate from UIUC? Beth: I graduated in 2011, after my third year. VO: What was your reason for graduating early? Beth: I had a lot of AP credits before starting college. Then going into my junior year, I just realized that if I took something like 5 English courses each semester that I’d be able to graduate that year. However, looking back I sort of wish I had stayed all 4 years, because my last year was so fun. College is fun. I did take the next year to do a one-year MA, though, so I still got in my 4 years of school I guess. VO: What was your MA in? Beth: I got my MA in film studies, at King’s College London. In the UK most Masters courses are just one year full-time. VO: What do you do now? 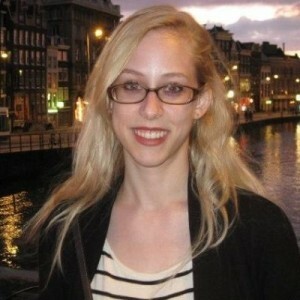 Beth: Now I work as a video editor at Teak, an agency/production company in San Francisco. The Research Park Career Fair is still ahead of us (March 15), but much of the spring career fair season is winding down. If you went to a career fair this year, well done! Career fairs are a great way to meet potential employers, explore career paths, and practice your interviewing and networking skills. If you didn’t go to one, definitely plan to take advantage of them next year! While some fairs (e.g., the Engineering Career Fair, the Urban Planning Fair) are intended for students with specific technical skills, many fairs feature recruiters seeking students from a variety of programs. Fairs are also targeted towards particular fields of relevance to department of English majors. The Design+ Job Fair, the Arts and Culture Fair in Chicago, the Educators Fair, and the Illini Career and Internship Fair are particularly oriented towards the interests and skills of people who study English and Creative Writing.